Unlike Newton and Einstein, who contributed to a wide range of fields, Stephen Hawking focused on cosmology where he made significant contributions ever since his graduate student days in Cambridge University, U.K. If one had to name only three physicists who touch the lives of people beyond the limits of labs and universities, the answer, without any hesitation, could be Newton, Einstein and Stephen Hawking. Newton’s laws of motion, especially the third one, inspire millions to query and to quip, and Einstein has, in the 20th and 21st centuries, become the epitome of what a scientist should be like. 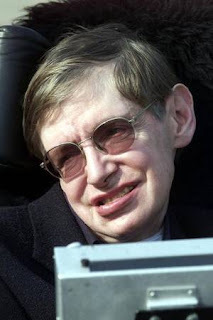 In the case of Hawking, his life and works touch millions not just because of his bestselling book, The Brief History of Time, but also because, unlike Newton and Einstein who contributed to a wide range of fields, he focused on cosmology, despite his extreme physical disability. Besides his contribution to cosmology since his graduate student days in Cambridge University, U.K., Hawking’s life was a major inspiration to people in general. In 1962, one day he had difficulty tying his shoelaces. It was no small problem and he was diagnosed with Amyotrophic Lateral Sclerosis (ALS), a motor neuron disease. The incurable disease could be fatal and he was given two years to live by doctors. He was then just over 22 years. He did go into a depression, doubly so because his dream of working with the famous cosmologist Fred Hoyle in Cambridge did not materialise. It was then that his relationship with Jane Wilde, whom he later married, deepened and helped pull him out. He went on to do his PhD under the supervision of Dennis Sciama in Cambridge University’s physics department. Ironically, Hawking ended up refuting Hoyle’s ideas in his PhD thesis itself. The dominant paradigm of the universe at the time Hawking began his PhD was the Steady State theory of the universe, of which Hoyle was a major proponent. In papers published in the late 1940s, Hoyle argued that the universe had no beginning. Despite evidence that galaxies are moving away from each other, he argued that more matter was being created that kept the overall density a constant. This theory was a serious contender to the Big Bang theory. In fact, Hoyle was the one who in 1950s coined the term, ‘Big Bang’, though derisively. When Hawking came into the picture, he was influenced by the work of Roger Penrose, who was an applied mathematician working on singularity theory. Sciama drew Penrose’s attention towards stars and black holes and the latter came up with the theory that if a star collapses beyond a point, it would be unable to stop this. With general theory of relativity, it could only reach an infinite density at the end of the process, or a singularity. Hawking got interested in this work and applied it to the whole universe. He came up with the result that if general relativity was correct, there must have been a point far back where there must have been such a singularity. This was his contribution to the Big Bang cosmology and for which he got his PhD. This work, early in his career, was just one step but a big one in making him an internationally known scientist. Among many interesting books on Hawking is ''Stephen Hawking: A Graphic Guide'' by J.P. McEvoy and Oscar Zarate, which helped the author in writing this article.